It is not often that you find an original, unmolested, matching numbers XKE with an original interior. This fabulous color combination of golden sand and cinnamon, with long term ownership, has only traveled 87,028 miles since new. 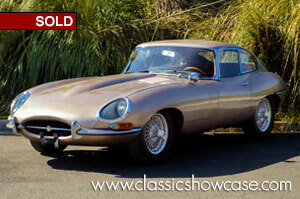 We reccomend keeping this XKE in a preservation status, due to it's condition and originality. After waking the car up from long term storage, we performed mechanical services to bring the car back to road-worthy status. While the Coupe may be enjoyed now as-is, we recommend repainting the car and addressing a few other cosmetic details to take it to the next level it deserves. The purchase of the Coupe includes a Jaguar Heritage Certificate, and it's original jack.